HMD Global much rumoured and much leaked revived Nokia 3310 is to be exclusively stocked on the UK high street by Carphone Warehouse, according to multiple industry sources. One of the sources told Mobile that Carphone Warehouse would be the launch partner for the famous feature phone, though couldn't comment on the other devices HMD are expected to launch at the event. The exit of Nokia and other players from the feature phone market was matched by the market’s contraction, though manufacturers still within this space have previously told Mobile they feel this contraction has ended. Nokia’s MWC event promises more than just the return of their most famous feature phone, but also a probable flagship-ish spec device. 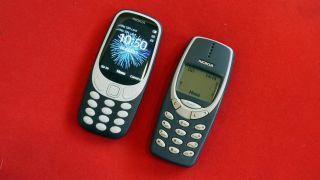 Originally launched in the year 2000, the Nokia 3310 gained a reputation at the time for features such as Snake, SMS functionality and customizable covers and ringtones. As time progressed, it came to be seen internationally, perhaps through heart shaped glasses, as super tough device from a simpler time when a phone was just expected to be a phone. As time went on, Nokia struggled to keep pace with iOS and android, with their Symbian OS shrivelling in market share until their acquisition by Microsoft. After meeting a similar end in the device and OS space, now the Nokia name lies with Finnish newcomer HMD Global. Under a year old, HMD Global bolstered its credentials as a manufacturer in early 2017 with a string of senior figures poached from rivals such as HTC, Microsoft, Samsung and Bullitt Group. We've approached Carphone Warehouse for a response and are awaiting their reply.